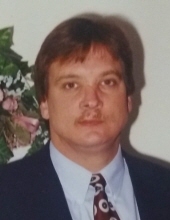 Barry Alan Rucker, 53 of Brownstown, passed away on Wednesday, April 3, 2019. He was born May 5, 1965, the son of Darrell Eugene and Patricia Ann (McQueen) Rucker. Barry graduated from Brownstown High School and was a member of Immanuel Lutheran Church in Seymour. He worked in Assembly at Cummins. He would often help his parents in their upholstery shop and enjoyed working on cars and fixing anything mechanical. He loved spending time with his family and friends. He is survived by his parents, his three sons, Nathan Alan (Natasha) Rucker, Adam Wayne Rucker and Jacob Tyler Rucker; three grandchildren, Forrest Alan Rucker, Makiya Diane Richmond and Dwight Leon Richmond III; two brothers, Vince Leonard Rucker and Kevin Lynn Rucker, and several nieces, nephews and cousins. He was preceded in death by his paternal grandparents, Frank and Bernice Rucker and maternal grandparents, Boston and Florence McQueen. Services will be conducted at 11:00 AM on Tuesday, April 9, 2019, at Winklepleck & Brock Funeral Home in Brownstown with Pastor Rick Grant officiating. Burial will follow at Spraytown Cemetery. Friends and family may call at the funeral home on Monday from 3 to 8 PM and Tuesday after 10:00 AM until time of service. Memorials may be made to the family through Winklepleck & Brock Funeral Home. To send flowers or a remembrance gift to the family of Barry Alan Rucker, please visit our Tribute Store. "Email Address" would like to share the life celebration of Barry Alan Rucker. Click on the "link" to go to share a favorite memory or leave a condolence message for the family.